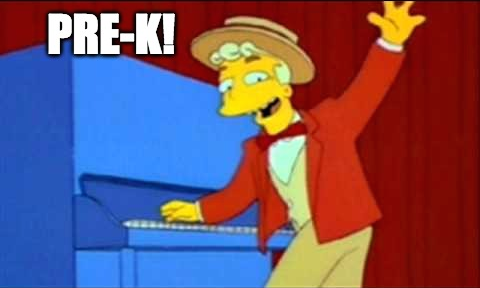 Rod Dreher at The American Conservative has a post on people invoking the concept of “social construction” with his lead example being a speech and debate team that always changes the subject to a critical race theory rant about the conventions of debate itself, even if the pre-specified debate topic is about national service or green energy or whatever. The judge then awards the match to this non sequitur, invoking “social constructionism” to explain himself. I can get angry about this on a whole other level than Dreher does, precisely because I think social construction is a valuable concept. And I really do take the concept seriously. My PhD training is as a neo-institutionalist (ie, how organizational practices are socially constructed), I have an ASR on market information regimes (ie, how socially constructed market data shapes market behavior), and my current project is on relational work (ie, how exchange is socially constructed as market or social). I also advise grad students on these sorts of topics. So it’s not like I’m some angry epistemological realist who goes around giving swirlies to phenomenologists. Social construction is a really useful concept, but unfortunately, this really important concept has the misfortune of being popular with idiots who don’t really understand it. When this sort of person says “x is socially constructed” the implication is “therefore we can ignore x.” When I lecture on social constructionism I ridicule this sort of thing as “ruby slippers” social constructionism, as if your sociology professor tells you “why Dorothy, you’ve had the power to solve inequality all along, just click your heels three times and say ‘race is a social construct,’ ‘race is a social construct,’ ‘race is a social construct. '” If you really grok social constructionism, the appropriate reaction to somebody invoking the concept in almost any practical context is to shrug and say “your point being?” If you actually read Berger and Luckmann rather than just get the gist of it from some guy with whom you are smoking weed, you’ll see that the key aspects of social constructionism are intersubjectivity and institutions. That is social construction is important because social interaction is premised on shared conventions and becomes deeply codified to the extent that for most purposes it might as well be objective. Suppose you had two contractors bidding on remodeling your kitchen. One of them says that it will be done in X days, involving Y materials, and cost you $Z. The other gives you a fascinating (but at times dubious) lecture about whether time exists in the abstract or only relative to perception, the ugly history of exploitation in the formica industry, and the chartalist theory of money. You then go back to the first contractor, who is bewildered and has no rebuttal to the second contractor’s very, um, creative arguments. You would have to be an idiot to award the bid to the second contractor, even if you think they are right about everything they said. As it happens, I actually believe that time, kitchen materials, and money are all socially constructed. It is also true that kitchen remodeling is also a social construct and one of the conventions of that particular social construct is that you talk about things like time, material, and price rather than offer a critical perspective on the same. For each quote, guess the source: a classic of gift exchange or a Los Angeles Times article about deposed Sheriff and soon to be plea bargainee, Lee Baca. Highlight the text to see the answers and score your quiz! As long-time readers will remember, I have been collecting Twitter with the R library(twitteR). Unfortunately that workflow has proven to be buggy, mostly for reasons having to do with authentication. As such I decided to learn Python and migrate my project to the Twython module. Overall, I’ve been very impressed by the language and the module. I haven’t had any dependency problems and authentication works pretty smoothly. On the other hand, it requires a lot more manual coding to get around rate limits than does twitteR and this is a big part of what my scripts are doing. I’ll let you follow the standard instructions for installing Python 3 and the Twython module before showing you my workflow. Note that all of my code was run on Python 3.5.1 and OSX 10.9. You want to use Python 3, not Python 2 as tweets are UTF-8. If you’re a Mac person, OSX comes with 2.7 but you will need to install Python3. For the same reason, use Stata 14 for tweets. One tip on installation, pip tends to default to 2.7 so use this syntax in bash. I use three py scripts, one to write Twython queries to disk, one to query information about a set of Twitter users, and one to query tweets from a particular user. Note that the query scripts can be slow to execute, which is deliberate as otherwise you end up hitting rate limits. (Twitter’s API allows fifteen queries per fifteen minutes). I call the two query scripts from bash with argument passing. The disk writing script is called by the query scripts and doesn’t require user intervention, though you do need to be sure Python knows where to find it (usually by keeping it in the current working directory). Note that you will need to adjust things like file paths and authentication keys. (When accessing Twitter through scripts instead of your phone, you don’t use usernames and passwords but keys and secrets, you can generate the keys by registering an application). I am discussing this script first even though it is not directly called by the user because it is the most natural place to discuss Twython’s somewhat complicated data structure. A Twython data object is a list of dictionaries. (I adapted this script for exporting lists of dictionaries). You can get a pretty good feel for what these objects look like by using type() and the pprint module. In this sample code, I explore a data object created by infoquery.py. Another tricky thing about Twython data is there can be variable number of dictionary entries (ie, some fields are missing from some cases). For instance, if a tweet is not a retweet it will be missing the “retweeted_status” dictionary within a dictionary. This was the biggest problem with reusing the Stack Overflow code and required adapting another piece of code for getting the union set of dictionary keys. Note this will give you all the keys used in any entry from the current query, but not those found uniquely in past or future queries. Likewise, Python sorts field order randomly. For these two reasons, I hard-coded tw2csv as overwrite, not append, and build in a timestamp to the query scripts. If you tweak the code to append, you will run into problems with the fields not lining up. Anyway, here’s the actual tw2csv code. One of the queries I like to run is getting basic information like date created, description, and follower counts. Basically, all the stuff that shows up on a user’s profile page. The Twitter API allows you to do this for 100 users simultaneously and I do this with the infoquery.py script. It assumes that your list of target users is stored in a text file, but there’s a commented out line that lets you hard code the users, which may be easier if you’re doing it interactively. Likewise, it’s designed to only query 100 users at a time, but there’s a commented out line that’s much simpler in interactive use if you’re only querying a few users. You can call it from the command line and it takes as an argument the location of the input file. I hard-coded the location of the output. Note the “3” in the command-line call is important as operating systems like OSX default to calling Python 2.7. And here’s the actual script. Note that I’ve taken out my key and secret. You’ll have to register as an “application” and generate these yourself. targetlist=sys.argv #text file listing feeds to query, one per line. full path ok. This last script collects tweets for a specified user. The tricky thing about this code is that the Twitter API allows you to query the last 3200 tweets per user, but only 200 at a time, so you have to cycle over them. moreover, you have to build in a delay so you don’t get rate-limited. I adapted the script from this code but made some tweaks. One change I made was to only scrape as deep as necessary for any given user. For instance, as of this writing, @SociologicalSci has 1192 tweets, so it cycles six times, but if you run it in a few weeks @SociologicalSci would have over 1200 and so it would run at least seven cycles. This change makes the script run faster, but ultimately gets you to the same place. The other change I made is that I save two versions of the file, one as is and the other that pulls out some objects from the subdictionaries and deletes the rest. If for some reason you don’t care about retweet count but are very interested in retweeting user’s profile background color, go ahead and modify the code. See above for tips on exploring the data structure interactively so you can see what there is to choose from. As above, you’ll need to register as an application and supply a key and secret. You call it from bash with the target screenname as an argument. These are all good studies, and they raise important questions. But none of them is an indictment of preschool, exactly, so much as an indictment of particular approaches to it. How do we know that? Two landmark studies, first published in 1993 and 2008, demonstrate definitively that, if done right, state-sponsored pre-K can have profound, lasting, and positive effects — on individuals and on a community. It then goes on to explain that the Perry and Abecedarian projects were studies involving 123 and 100 people respectively, had marvelous outcomes, and were play rather than drill oriented. The phrase “demonstrate definitively” is the kind of phrase you have to very careful with and it just looks silly to say that this definitive knowledge comes from two studies with sample size of about a hundred. Tiny studies with absurdly large effects sizes are exactly where you would expect to find publication bias. Indeed, this is almost inevitable when the sample sizes are so underpowered that the only way to get β/se>1.96 is for β to be implausibly large. (As Jeremy Freese observed, this is among the dozen or so major problems with the PNAS himmicane study). The standard way to detect publication bias is through a meta-analysis showing that small studies have big effects and big studies have small effects. For instance, this is what Card and Krueger showed in a meta-analysis of the minimum wage literature which demonstrated that their previous paper on PA/NJ was only an outlier when you didn’t account for publication bias. Similarly, in a 2013 JEP, Duncan and Magnuson do a meta-analysis of the pre-K literature. Their visualization in figure 2 emphasizes the declining effects sizes over time, but you can also see that the large studies (shown as large circles) generally have much smaller β than the small studies (shown as small circles). If we added the Tennessee and Quebec studies to this plot they would be large circles on the right slightly below the x-axis. That is to say, they would fall right on the regression line and might even pull it down further. This is what publication bias looks like: old small studies have big effects and new large studies have small effects. 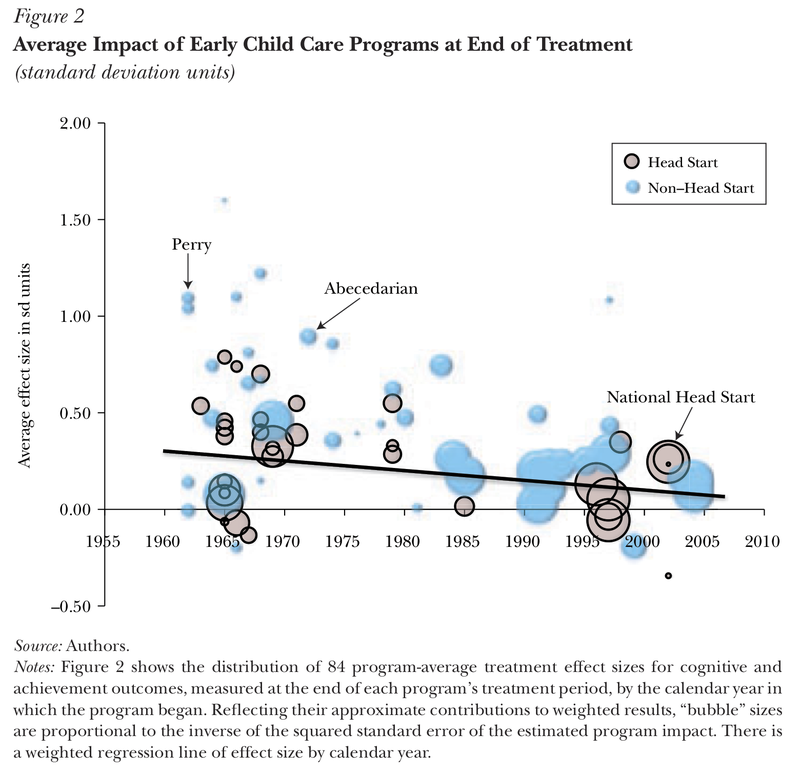 I suppose it’s possible that the reason Perry and Abecedarian showed big results is because the programs were better implemented than those in the newer studies, but this is not “demonstrated definitively” and given the strong evidence that it’s all publication bias, let’s tentatively assume that if something’s too good to be true (such as that a few hours a week can almost deterministically make kids stay in school, earn a solid living, and stay out of jail), then it ain’t.